We so often hear that the age of independent bookstores is over. With the rise of Amazon and other online sellers, we have even seen the fall of the very chains that were supposed to be putting small-town, independent bookstores out of business – putting the future of all physical bookstores, independent or otherwise, into question. Many people, myself included, still love lingering in small, independent bookstores, of course. They cherish places where people can chat about books and serendipitously find titles they might otherwise miss. Even so, these same people (and again, I include myself) often cave to the convenience and cost savings of clicking the Amazon button. I was fortunate to be able to get more expert insight into these matters from my book club buddy Janice Holmes, who owns and runs her own small independent book store, The Annapolis Bookstore, in Annapolis, MD. TZ: How did you get into the bookselling business? Was it always a dream, or is it something that you fell into? JH: While I have worked in the business, especially in my New York City working days, becoming an owner of a bookstore hinged more on fate than planning. At a time in life when I needed and was prepared to turn full focus in a new direction, a friend invited me to help her with her fledgling bookstore. The ensuing partnership proved to be a successful one, and we are now in our tenth year. TZ: What’s your favorite part of owning and operating a small, independent bookstore? Your least favorite part? JH: Stories. As we have many used books, there are the stories about where they have been, the stories they contain, and the stories of the people who walk in the door. We have a small house built out of books in the back garden that contains a serial story book. Storytellers of all ages add to the tale that began with “Once upon a time, in an old town near the sea, there was a secret garden. There are many secret gardens in an old town but this one was behind a very special bookstore.” I like that the bookstore provides a platform where I can make manifest ideas I have that would otherwise be lost in the ether of things I can just imagine. I like the delight in the discovery of what we have created at The Annapolis Bookstore that we witness every day. I don’t like the nature of retail, the figuring out how to financially support the existence of a bookstore these days. One cannot charge for the experience people find rewarding here, whether or not they choose to buy a book that will likely be less expensive and more convenient to purchase on line. TZ: I get emails from The Annapolis Bookstore pretty regularly about author appearances and other events. Do you do all the social media and other marketing yourself? And who dreams up the events? JH: We have a wonderful young woman, Jinny, who stays on top of social media as I am unwilling to devote any more of my life to mastering screens. We all generate ideas according to our strengths and interests. Authors and publishers and the occasional film-maker contact us with proposals as well. TZ: Your website boasts about marriage proposals, birthday surprises, and other community events that seem to have almost nothing to do with books. You have a café, too, as do most bookstores these days, and even many libraries for that matter. Annie Dillard and Victor Hugo sandwiches aside, I suppose this helps make the store more of community center and – maybe? – helps with the profits, though I would guess that running a food service isn’t much more lucrative than selling books. Did you intend to serve this function when you first opened the store? How did it evolve? JH: We did hope to improve the “bottom line” with the café, but it basically breaks even and just adds to the overall service and charm of the place. We are, truly, a community center; I think we all pride ourselves on that account. But it somehow has everything to do with books. The collective presence of “story” is the heart of the place, and that is compelling. Years ago, one of my editor friends had on their desk a quote from the philosopher Santayana: “Man is an animal that tells stories.” That stayed with me. My experience as a bookseller (and as a bartender) is that man is an animal that needs to tell stories and to hear them. People are drawn here; community building is something of a mission, and we are successful in that. The “business” of books is another matter, and there we hang by the proverbial skin of our teeth. TZ: Do you think independent bookstores can survive in this Amazon era, even as community centers, and, if so what do you think it will take to keep them alive? Does it take a college town, lots of foot traffic, a café, a mail-order trade for rare and used books, or what? JH: We live in a time when it is especially important to be thoughtful about the distinction of price and cost. All over the country there are efforts to support sustainable local economies i.e., “Buy Local.” We hear in our store, so very often, how wonderful it is to be in a “real” book store, what a fine collection we have, favorite place, bring all my company here – yet only a handful consistently buy books here. 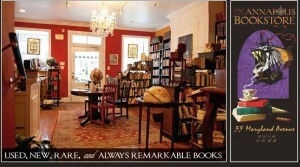 Even bibliophile friends of means rarely buy their books from this local independent. The price point and convenience of on-line commerce is a powerful incentive, but the cost is a desolate Main Street. Annapolis has no downtown grocer, and the lone family-run hardware store is attracting a Royal Farms franchise. We will ultimately live in the communities we create. I am heartened by the young artisans I meet who are attracted to the craft of beer making or baking or sewing, even farming. It is the thoughtful assessment of what something is “worth” that can support local businesses, including bookstores.